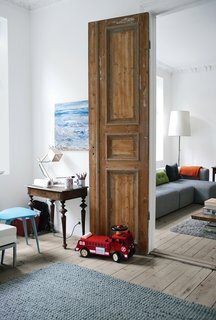 You may think that an existing or historic home—known for its drafty windows, old-fashioned mechanical systems, and obsolete construction materials and techniques—would be one of the least sustainable, green-friendly buildings around, but you'd be oh-so-very wrong! With a few small changes and regular maintenance, existing buildings are some of the most sustainable around. 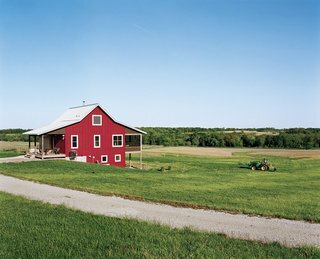 In fact, most existing homes and buildings that were constructed before the advent of air conditioning incorporated sustainable, green, or passive cooling techniques that took advantage of the local climate, like transom windows above doors for cross-ventilation, deep porches for shading from summer sun, and siting to take advantage of prevailing winds. 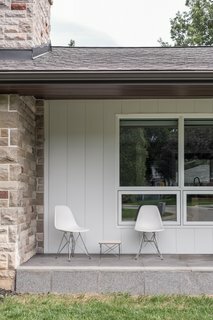 Midcentury homes often incorporated shading devices like front and back porches. On top of that, existing buildings typically sourced their materials locally, used biodegradable elements, and were constructed to last generations rather than just a few years. If you're considering upgrading, rehabbing, or retrofitting an existing building, here are a few ideas to consider. 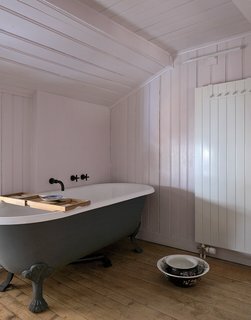 A new coat of glazing (and a bit of a modern paint job on the exterior) brings a clawfoot bathtub back to life. Think about refurbishing or refinishing floors, windows, fixtures, faucets, bathtubs—and even bathroom tile—rather than getting rid of original features. Older homes tended to have what we would consider today to be high-quality elements that are above current industry standards, like 3/4" thick hardwood floors and solid wood doors. These materials can be easily sanded down or scraped in preparation for a new coat of paint or left exposed, extending the life of the product and even acting as a focal point in a space. 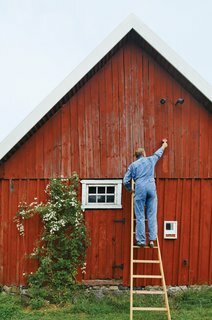 Repainting isn't necessary to get new life out of old building materials—scraping paint off can provide an entirely new aesthetic that still speaks to an element's history and materiality. Similarly, if you're considering replacing or removing historic windows in your home in exchange for more energy-efficient windows, it might not be necessary to completely upgrade and replace all of your windows. Look into repairing specific deteriorated parts, like a broken sash cord on a double-hung window or deteriorated wood trim. It is most likely more cost effective and aesthetically authentic to the existing building, and is certainly more sustainable than throwing away otherwise viable construction materials. Rather than throwing away and replacing the existing French doors, paint was removed from the doors and their corresponding interior shutters by sandblasting. If you're concerned about heat loss during cold winter months, look into installing weatherstripping around the windows (doors too!). In a worst-case scenario, you can install storm windows on the interior to prevent heat loss in cold months, without affecting the building's exterior appearance. 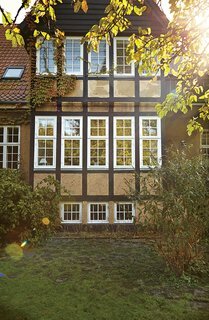 Original windows with weatherstripping, when well-maintained, can often be as energy-efficient as new double-glazed windows. Finally, one place where your pack-rat instinct probably isn't the greenest is when it comes down to appliances. Most older homes—and their kitchens and boilers in particular—were outfitted decades ago when gas prices were lower, and when we didn't have as much knowledge about the long-term damage that the mining of fossil fuels and other non-renewable resources has on the environment. 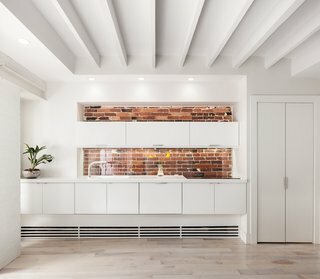 An older building doesn't mean that it can't also be modern, particularly in the kitchen. As a result, it's a good idea to swap out your groovy 1960s refrigerator and choose something that is more energy-efficient. Try and look for appliances that have been EnergyStar-certified, or a product that has been reviewed by the U.S. Department of Energy. And if, after all that, you still want that retro vibe in your kitchen, look no further than Smeg! 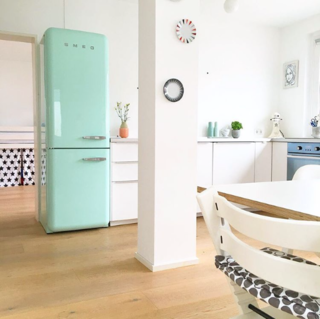 @solebich shared this photo of a bright kitchen-dining area with a turquoise Smeg refrigerator. Ultimately, with just a few tweaks and regular upkeep, old homes don't have to be a burden—on the homeowners or the environment.